UNITED NATIONS, Apr 1 2014 (IPS) - When Western powers, led by the United States, decided to throw Russia out of the Group of 8 (G8) industrial nations, it was aimed at punishing and “isolating” President Vladimir Putin for his intervention in Ukraine and “annexation” of Crimea. “What’s next? Expel Russia from the United Nations and the G20?” an Asian diplomat jokingly asked one of his colleagues at the U.N. delegate’s lounge last week, hinting at what could only be construed as a Western political fantasy. The procedure the G7 followed to transform itself to G8 in 1998 (with the inclusion of Russia) was as opaque as the process that led to Moscow’s virtual expulsion. The G8 move was pretty tame because it was a decision taken by seven Western industrial nations: the United States, Britain, France, Germany, Canada, Italy and Japan, along with the European Union. But Russia is also a member of the G20, a coalition of both developed and developing countries, as well as the economic powerhouse called BRICS (comprising Brazil, Russia, India, China and South Africa). 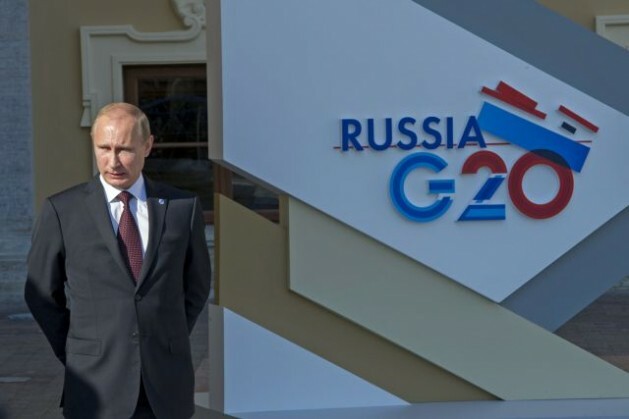 Australia has reportedly warned that Russia may be excluded from the next G20 summit meeting in Brisbane in November. But that is more easily said than done. On the sidelines of last week’s Nuclear Security Summit in The Hague, the foreign ministers of BRICS warned Australia against any such action. The G20 members include Argentina, Australia, Brazil, Canada, China, France, Germany, India, Indonesia, Italy, Japan, Republic of Korea, Mexico, Russia, Saudi Arabia, South Africa, Turkey, United Kingdom, United States and the European Union (EU). At a General Assembly vote last Friday, on a resolution implicitly critical of Russia on the upheaval in Ukraine, Russia’s four BRICS partners abstained, joining 54 others. The final vote was 100 for the resolution, 11 against, but with 58 abstentions in an Assembly with 193 votes. He pointed out that the G7/G8 originally came into being in the wake of the oil crisis to tackle economic issues and promote a dialogue of the G5/G7 with the Organisation of Petroleum Exporting Countries (OPEC) to promote agreements and avoid confrontations. Soon, it became clear the G7 process was not effective, and the initial aim of informal but frank and spontaneous exchange of views among the leaders failed. “Their own bureaucracies and ministries in governments did not want this process to move forward,” said Raghavan, a veteran journalist and a former editor-in-chief of Press Trust of India (PTI) who has covered the United Nations, both in Geneva and New York, for several decades. But instead of abandoning the annual meetings, he said, the G7 continued to meet, with the original economic focus lost, and with costly preparations and meetings of “sherpas”, where the gatherings themselves became too formalised, and where the outcome had been already decided or agreed to at the lowest common measure of accord. He also pointed out that the G7/G8 increasingly began pronouncing themselves on all kinds of subjects – with none of the leaders able to ensure the decisions were carried out in their own countries. Vijay Prashad, author of “The Poorer Nations: A Possible History of the Global South”, told IPS the procedure the G7 followed to transform itself to G8 in 1998 (with the inclusion of Russia) was as opaque as the process that led to Moscow’s virtual expulsion. The Group of Seven (Canada, France, Germany, Italy, Japan, UK and USA) came together in 1974 to consolidate their response to the major thrust from the Third World Project: an assault of the oil weapon of 1973 that consolidated in the U.N. General Assembly resolution 3201 in May 1974 for a New International Economic Order (NIEO). The G7 was formed, as former U.S. President Gerald Ford put it, “to ensure that the current world economic situation is not seen as a crisis in the democratic or capitalist system,” Prashad said. “It had to be seen as a momentary shock, not a systematic challenge,” he added. The collapse of the Third World Project, the rise of a new International Monetary Fund (IMF)-driven neo-liberal dispensation and the demise of the Union of Soviet Socialist Republics (USSR) moved the G7 to welcome battered Russia into its arms, said Prashad, who is the Edward Said Chair at the American University of Beirut in Lebanon. Membership in the G7 came with the promise that the North Atlantic Treaty Organisation (NATO) would not move one step closer to Russia than the German border, he added. Raghavan told IPS the annual G20 meeting pronounces itself on a range of political, economic and other arenas — but with less and less effect — whether (as they have done several times) for concluding Doha trade negotiations or other areas. Some of their views on global financial stability – addressed to the Bank of International Settlements – have factually been very diluted in actual decisions and norms because of the lobbying of the big financial groups, both in New York and London, said Raghavan, author of the just released “Third World in the Third Millennium”. Prashad said when the credit crisis startled the West in 2007, the G8 hastened to China and India, asking for funds. If the money came – as it did – the G8 would wind up its operations and the G20 (with Brazil, China, India and South Africa as members) would take over as the effective executive managers of planetary affairs – which it did not, he added. The G20 had been formed during the Asian financial crisis of 1997-98 to ward off any nationalistic reactions to that crash. “As the Western stock markets rallied by 2011, the promise was forgotten,” he said. The G8 continued – much to the chagrin of the BRICS bloc, which had assumed it would now share power. They agree the West’s move east is dangerous, and it is unlikely they will allow for the expulsion of Russia from the G20 – itself of limited consequence, he noted.